Welcome my husband, Randy! 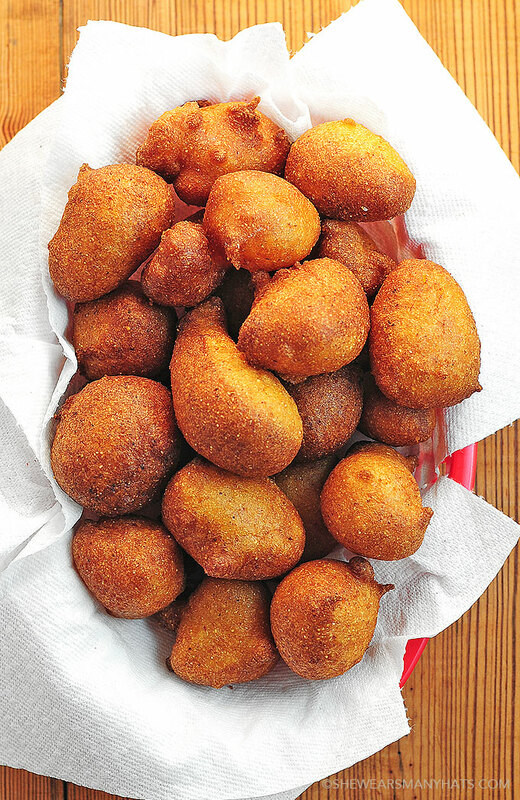 He’s here to share a delicious Hush Puppies Recipe. Or is it hushpuppies recipe? I grew up with them being known as hushpuppies, one word. However you write it, these little babies are the perfect side dish to serve at a fish fry, BBQ, or any excuse you can think of to make hush puppies (or hushpuppies). Take it away Randy! When you’re going to be bad, it should be good. Maybe that’s not exactly how the saying goes but just work with me here. Hushpuppies are not an everyday or even every week thing but every now and then when it’s time to splurge, make it count. 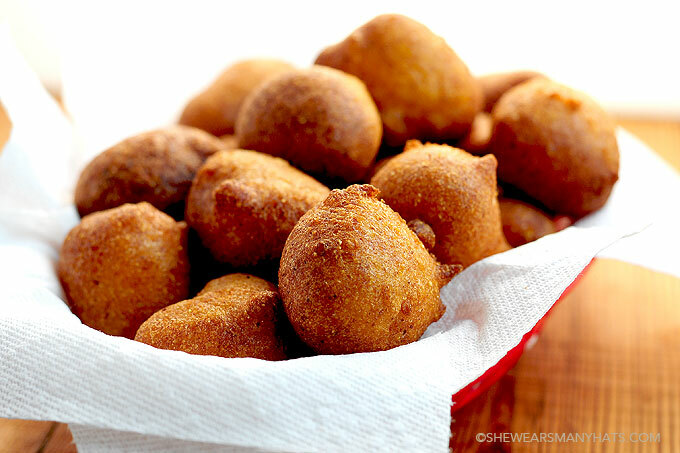 According to legend the name “hush puppies” is derived from the bad idea someone had of tossing bits of fried cornmeal to the dogs to keep them quiet and happy at a cookout. Take my advice, bring along Scooby Snacks for Fido and make hush puppies for your two legged guests only. When eaten warm just a few minutes out of the fryer, they are quite a treat. The outside is golden brown and crispy. 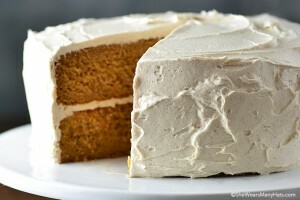 The inside is warm and soft with a little sweet and a little heat. What’s a fish fry without coleslaw and hush puppies? And, I don’t know about you but in my book there aren’t many food presentations that look as good as pulled pork BBQ on a paper plate with hush puppies and coleslaw. What to do with the oil leftover from frying? Speaking of frying, on the occasions we do deep-fry something it can be a pain knowing what to do with the used cooking oil. Some people strain it and bottle it for future use but I’d worry about strange odors and flavors in the next meal and I’m not sure that would be safe. Definitely don’t pour it down the drain. I wouldn’t want to dump it in our yard either. Luckily a few months back I met a neighbor who collects used cooking oil then processes it to power vehicles some of his vehicles he uses in his lawn care business. That’s what I call a win-win. Also, even in our fairly rural area there’s a recycling center less than a mile away that accepts used cooking oil for recycling. A thermometer to gauge oil temperature is a must. You could end up with greasy pups frying with oil that isn’t hot enough, or burn them with oil that is too hot. A large spoon strainer or inexpensive Chinese spider is so helpful when deep frying at home. This post over at Serious Eats for wok deep frying has some great tips for wok deep frying at home that work for any deep frying. 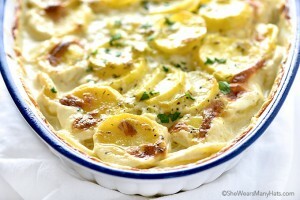 A classic Southern delicacy that is great served with fried seafood and pork BBQ. Pour oil do a depth of 2-3 inches into a heavy-bottom pot. Heat to 350-degrees F.
While oil is heating whisk together dry ingredients in a large bowl. Stir in onion and beaten eggs until well combined. Add beer; stir well to combine. Working in batches, carefully drop batter by rounded tablespoonfuls into 350-degrees F oil and fry for about 2-3 minutes until golden brown, turning as they fry to evenly cook. Carefully transfer hushpuppies using a slotted spoon (or Chinese spider strainer) to a paper towel-lined baking sheet or cooling rack to drain and cool. Using a spring-release ice cream scoop makes it easier to drop batter in uniform sizes into the oil. 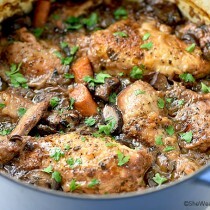 Before cooking the whole batch, cook one and check for doneness to determine exact cook time as oils, pots, will vary. Originally published June 6, 2014. 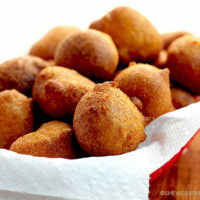 Eating hush puppies reminds me of my grandpa, love this post! Great hush puppies, Randy! Hush puppies are my everything in life. I can’t even remember the last time I had hush puppies. But suddenly all the memories come flooding back. I’m totally undone now. So scrumptious! I’ve got to try these. Have a marvelous Monday Amy! 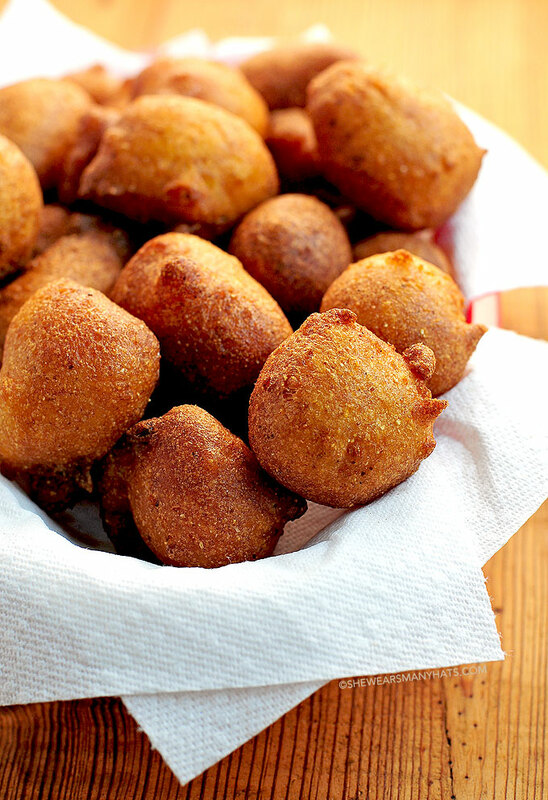 It sounds like it’s time for hushpuppies! I hope you enjoy them. 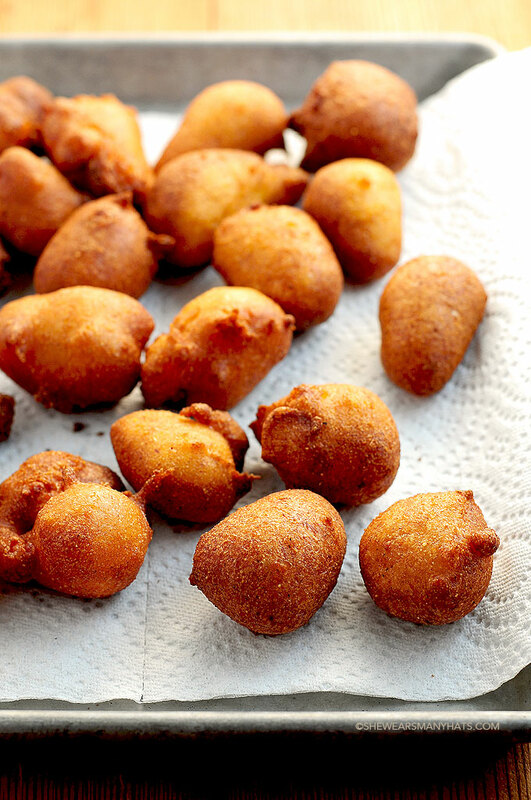 Fantastic tips on making hush puppies! Thank you, Randy! Oh my goodness … they are! 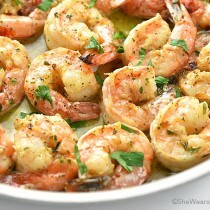 Perfect with fish or bbq. What brand or kind of cornmeal do you use? 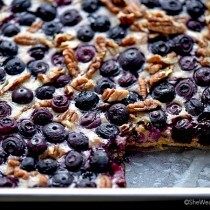 I like to use Martha White. That should be 3 teaspoons. Thank you for pointing out the typo, Suzy. The typo was corrected 2 years ago. Did you just mess up, Shannon? 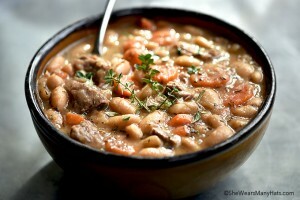 The recipe calls for teaspoons, not tablespoons. Once when we went camping, we had limited water, so we used canned tomatoes to mix the batter. YUM< YUM. That sound delicious, Sybil! Totally going to try that next time. I do not know, as I have never baked hush puppies before. What type of beers can you use? What kind of beer did you use in them?